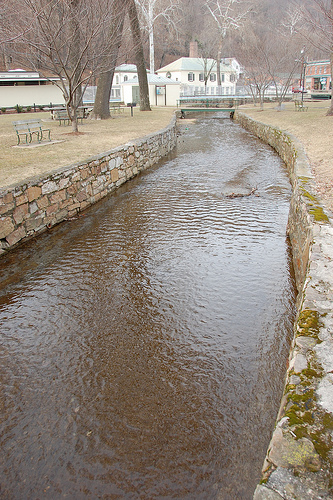 Berkeley Springs is the nation’s smallest state park. And I do mean small. It took me two days to figure out that the rather squat buildings in the town center were actually the famous Colonial bathhouses and spring site. By then it was time to leave! This little town in the mountains of West Virginia is an easy getaway, just 90 minutes from DC, with a no-stress vibe that’s, well, kinda hippie. Upscale spa weekend, it’s not. It’s a sweet, sleepy town probably best suited for a family vacation, teaching the kids how cool George Washington was. You could certainly have a romantic getaway with all the Victorian Bed & Breakfasts, but I find that kind of decor more kitsch than kink. Due to the town’s history as a spa destination, and the presence of the spring itself, you have plenty of spa options from the bare-bones Roman Baths right at the center of town with their private 750-gallon walk-in tubs, to the many boutiques. I had a very relaxing massage at The Bath House Day Spa, which had a homey feel perfect for first-timers who might otherwise be intimidated.